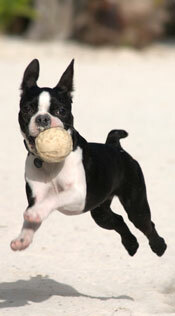 The Boston Terrier, also known as the “American Gentleman”, originated in Boston in the late nineteenth century. Robert C. Cooper purchased a dog named Judge who was part English Bulldog and part English Terrier. Judge was bred with a bulldog female by the name of Gyp. Their offspring, named Well’s Eph, is the ancestor of all modern Boston Terriers. Well’s Eph became quite popular in dog breeding circles, and his offspring were referred to as Bullet Heads, Round-Headed Bull-and-Terriers, American Terriers and Boston Bulldogs. These dogs were sold to the wealthy of Boston. The employees of these wealthy citizens would have access to the dogs breed them with other dogs. They puppies proliferated throughout the area, with many of the dogs finding their way into dogfighting rings. These dogs were very loyal to their masters despite the terrible circumstances they found themselves in. The modern Boston Terrier is still able to take care of himself, but has largely given up his fighting ways. The popularity of this kind of dog has soared in recent years, becoming one of the most sought-after dogs in America.